You’re probably thinking that my sugar detox didn’t work since I keep posting about desserts. The detox did work and while I continue to shun sugar, my sweet tooth still needs its fix. What I am finding is new ways to satiate it. Honestly, my sweet tooth is different from before. It doesn’t “crave” sugar and I don’t get mean like a bear when I need sugar!! Rather, my taste buds have opened up and I actually no longer have any cravings. What I do want, though, is creamy things. Unfortunately, most creamy desserts are made with lots of cream and milk and considering that I have a slight dairy intolerance, that means no milk, no ice cream, no yogurt, no fun. It also means finding alternatives, but with today’s growing number of dairy-free options, there’s gold at the end of the rainbow. 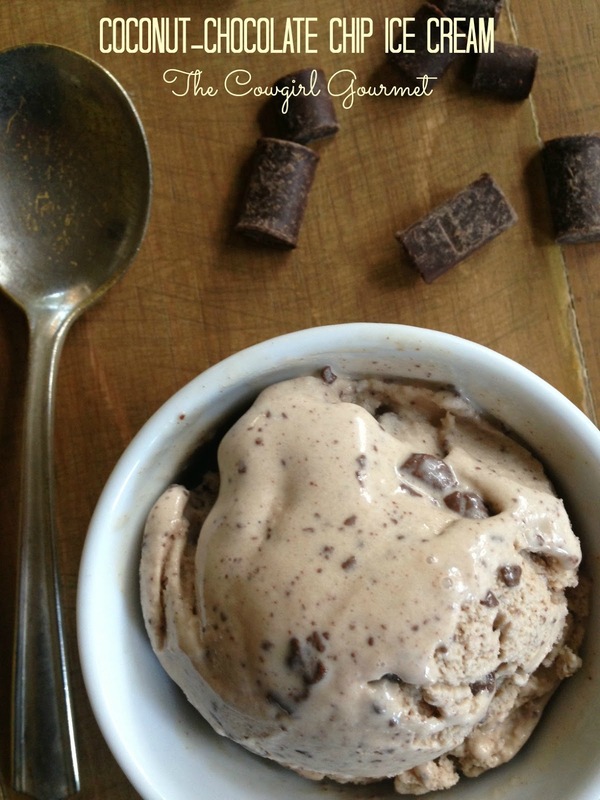 I have been making non-dairy ice cream that is just as good as the real deal–but without any side effects. Coconut milk is a virtual miracle in a can. I have made chia seed pudding with coconut milk, scrumptious coconut bars, whipped coconut cream, chocolate chia seed pudding and a fabulous vegan chocolate pudding with this liquid gold. I tend to prefer the full fat, organic version, but there is also low fat organic if that’s your preference. Coconut-chocolate chip ice cream was my inspiration. It sounds so creamy and delicious, right? And it is. Made with a single can of coconut milk, two farm fresh eggs, a splash of vanilla, two spoons of coconut sugar and some vegan chocolate chips, this ice cream saved the day. Low in sugar and dairy-free, I bet you and your family will think it’s the real deal, too. Creamy and luscious, but not even close to being too sweet, this dairy-free ice cream will soothe even the most difficult palates. It certainly won mine over. Place coconut milk, eggs, coconut sugar, vanilla and salt in a blender. Process until smooth and well combined. Drop in the chocolate chips and blend briefly so they are chopped up. The ice cream base will turn a nice mocha color. That's when you know it's ready. Process according to the directions of your ice cream maker. I refrigerate the mixture overnight and then make the ice cream the next day. Once the ice cream is ready, you can serve it immediately for a soft serve style ice cream or place in a container and let it harden in the freezer for an hour or so. When the ice cream is hardened from being in the freezer, let it sit out on the counter for about five minutes before serving. Garnish with a few chocolate chips.